Get a Free Janitorial & Office Cleaning Services Quote Today! Kleen King provides commercial janitorial services in Bozeman, Great Falls, Helena, Butte, and the surrounding areas in Montana. We have been offering janitorial cleaning services for over 32 years with the same management. When selecting a professional cleaning service, be sure it's one that's trustworthy. Kleen King only employs the most capable, responsible, reliable personnel. Each technician is carefully screened to ensure the security of your establishment. It also critical that technicians have been certified to handle the janitorial cleaning services your job requires. We are an IICRC, RIA, and CRI certified firm with a commitment to ongoing education by staying up to date with the latest in technological advances in cleaning and restoration. Kleen King uses the most advanced equipment and supplies. Our services include carpet and upholstery cleaning, area rug cleaning, floor cleaning (including tile and grout), window washing, trash removal, mold remediation, and more. If you would like us to take care of all your cleaning needs or only just a handful we are ready to accommodate your needs. In addition, Kleen King is a janitorial service company that's big enough and flexible enough to meet your scheduling needs, whether the job requires seven days a week or one day a month. With over 40 janitors, we can handle any job, including professional offices, industrial facilities, retail stores, restaurants, and casinos. With our screened and professional janitors you can expect a detailed and quality job. No longer will you worry about the cleanliness of your bathroom, filled up trashcans, or bringing clients into your office. Let us provide the service you deserve. 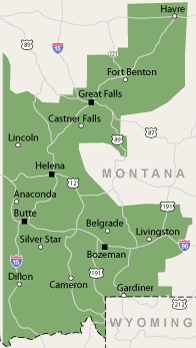 Kleen King provides office and janitorial cleaning in Bozeman, Great Falls, Helena, Butte, Havre, Livingston, Belgrade, Anaconda, Deer Lodge, East Helena, Clancy, Manhattan, Townsend, Whitehall, Three Forks, Box Elder, Ennis, and the surrounding areas in Montana. Contact us today for our professional janitorial and office cleaning services. Get a FREE Janitorial & Office Cleaning Services Quote Now! The boys were just awesome. "Leann & Jean are the housekeeping crew. They are very..."
"Very thorough, focused, professional, and friendly."